Let’s be real, when Halloween comes around we’ve got two concerns. Looking cute for our perfectly planned out Instagram post… and not spending our entire life’s savings on a costume! Well lucky for you, the search is over! I’ve come up with six costumes that are cheap, cute and even can be found here in Athens! This costume may be the simplest of them all! It’s so cute and actually keeps you warm! For the costume I bought a white hoodie from the men’s section at Walmart and just drew some black polka dots over it, paired with some black over the knee boots- and bam! Dalmatian! This costume cost me under $10- seeing I already have the boots! However, I was able to also find some black boots at Walmart if you don’t have any! This costume also is a perfect couples costume- find yourself a fireman! My alien costume goes down in time as one of my favorite costumes! Although this one cost the most and required a bit more run around, it was the least crafty costume! I found this silver skirt at Forever21, which they do still have in store! The antennas were from Charlotte Russe and the top was one I already had! However, all of these items can be found on Amazon Prime! I just put my hair in some space buns and put glitter on my face! This costume cost me a total of about $20! I have yet to try this one out, but it certainly is making the list for next year! You’ll be able to use anything in your closet! Then get a bit crafty, and tape streamers to it in an ongoing vertical pattern! A little party hat in your hair and you’re set! 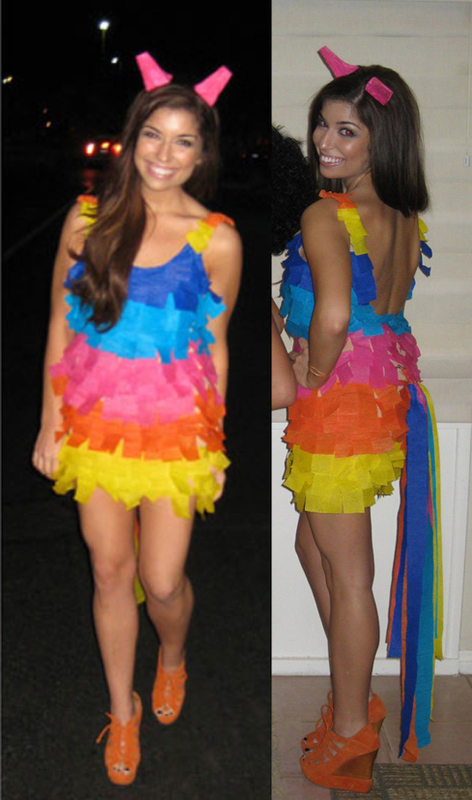 This costume may take the most time to make, but it costs $10 and looks so fun! If there’s anything we’re trying to avoid being this weekend, it’s a prisoner! But this costume is just too cute and my favorite for the weekend! This costume was also the cheapest! I already had a striped top, black skirt and black boots, so all I had to buy was some costume handcuffs at Walmart for $4! This costume is so cute and it’s totally awesome that your hair and makeup get to be however you want! This is my second costume for the weekend and it’s just so cute and simple! I dug out an old, tight tan dress I had and bought a set of lion ears and tail at Walmart for $8! I’ll draw some whiskers on my face and call it a look! This costume is so simple yet so cute- and costs close to nothing! Any girls out there that just live for punny costumes? Well, this one’s for you! I had a friend do this a couple years ago and it’s just so cute! Amazon Prime a gold skirt or leggings and just write the periodic abbreviation for Gold on your shirt! A second-year student, Camille Chernitsky is majoring in Early Childhood Education at the Patton College of Education. During her time at Ohio U, she is a member of Alpha Gamma Delta, Her Campus, SECO, SCEC and Hall Council! In her free time she loves to write and browse Pinterest!